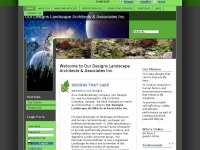 Our Designs Landscape Architects & Associates Inc. - Professional design work specializing in Universal Design and Human Factors Research to provide aesthetically pleasing, creative, and healing designs that appeal to a wide consumer group. The web server used by Ourdesigns.ca is located in Wayne, USA and is run by 1&1 Internet. There are many websites run by this web server. The operator uses this server for many hosting clients. In total there are at least 111 websites on this server. The language of these websites is mostly english. The Ourdesigns.ca websites were developed using the programming language PHP and served by a Apache server. For managing the data of the webpages the CMS Joomla! in the version 1.5 is used. XHTML 1.0 Transitional is used as markup language on the webpages. Indexing the data of the website and following hyperlinks on it is explicitly allowed by robot information.